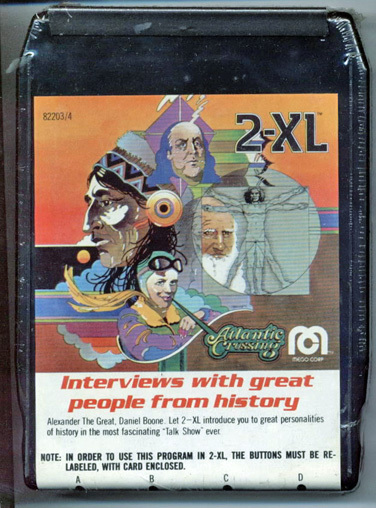 World of 2-XL: Mego 2-XL Program "Interviews with Great People from History"
* A NOTE ABOUT PRINTING CARDS OR BOOKLETS: I'm attempting to make these files in the original sizes. Unfortunately computers are odd beasts, and something that looks the correct size doesn't always print at the correct size (or even show up as the same size on different computers). If it doesn't print at the correct size for you, your best bet is to save the file and open it through an image program such as Adobe Photoshop and resize it there. A NOTE ABOUT MUSIC: All music titles have been arbitrarily chosen by Frank and myself. These titles were picked based on many different things: the program we first heard the song on, or the project we first used it in, or whatever imagery it made us think of the most. 15 second wav samples (approximately 325k each) have been included for your convenience to be used as a reference. The running times listed in the description above are NOT the sample length. They are the length of the song as it is used on the 2-XL tape pictured.